Creating unique, handmade artisan jewelry is my passion. I love using a mixture of metals in my jewelry, including copper, fine silver, sterling silver, and brass, as well as 14kt gold to create one of a kind Bohemian styled jewelry. I find inspiration in nature and I love to be outdoors. It’s easy to be inspired when you’re able to use all of your senses all at once! Many of my pieces incorporate natural gemstones or fossils. I have been known to use the occasional rock or shell collected from the beaches, deserts, and mountains that I have been lucky enough to wander upon. Take a look around, you will find a little bit of everything jewelry and perhaps a few non-jewelry surprises. Cuffs, Bangles, Rings, Necklaces, Pendants and the occasional Earring! Oh, and something else you should probably know…I am addicted to rocks, stones, gems whatever form or shape they take. I always seem to be picking up a rock or stone that I think will either look great in a piece of jewelry or even in the garden! 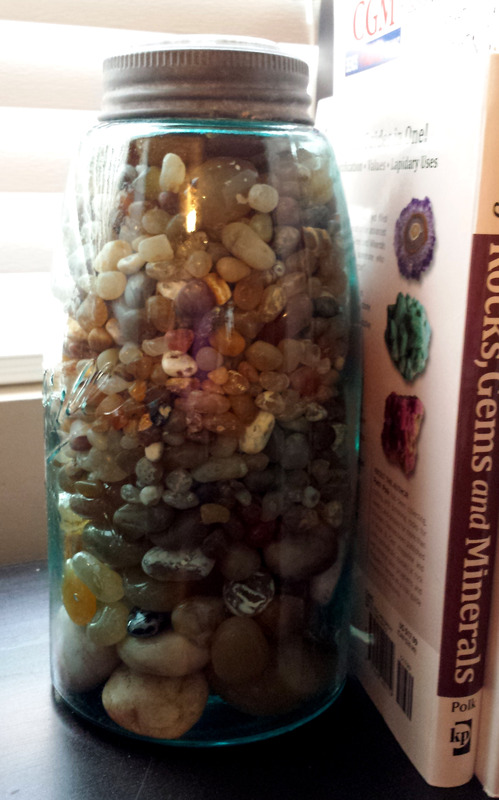 I have jars of polished agates all around the house…most of them picked up from the beach by my mom and polished by my dad, so I guess I come by this fascination naturally! For as long as I can remember, I’ve been a creative spirit. I can’t think of a time when I haven’t drawn, dreamed, painted, and created… AND…I’ve always LOVED jewelry. My first “real” job was working the counter of a jewelry store. The owners were inspiring, and so talented. I had never seen a bench jeweler at work before then and to say I was in complete AWE would be an understatement. I think that sparked a fire in me that was never extinguished…thank goodness…because now I get to do what I love everyday!!! Many people have asked me about the name of my shop…Peacock Gypsies…no surprise, I have always thought Peacock feathers were gorgeous, and early on I learned of the ancient folklore surrounding peacocks. My two favorite tales are that the Peacock was thought to have the power of resurrection, like the Phoenix. I like that because I feel like I have had to recreate myself a few times in this life. It is said that early Alchemists thought the fan of the peacock was associated with certain texts and images that are useful in turning base metals into gold. How awesome is that? The second part…Gypsies…well, that has to do with my mom. Mom often referred to my siblings and I as her little tribe of gypsies… always said that we have the hearts of Gypsies…that it’s in the blood…I don’t know about that but I do know we LOVE to travel and more than once have been described as “those creative types” LOL, Mom was a very “Creative Type”, an artisan to the core! Luckily for me, she passed some of that creativeness down the gene pool.